Looking to add a little excitement to your Half Double Crochet stitches? Look no further than this VERY simple variation on the HDC! All it takes is inserting your hook into a different loop than usual to come up with this beautiful, faux knit pattern. What’s great about this stitch is that it shows up on both the back and front sides of your work, so it works beautifully for scarves, washclothes, etc. And it’s not as bulky as the front/back post method or the front/back loops only method. 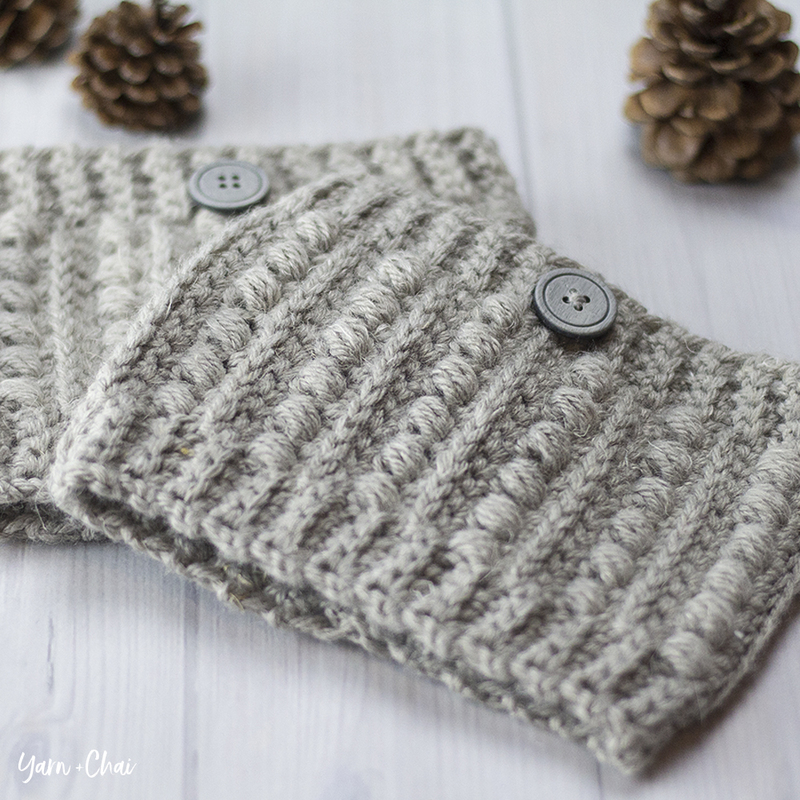 When you’ve got it figured out, give this cowl & boot cuffs set a try! First, we’ll take a look at the Half Double Crochet stitch. Normally, you’d yarn over and insert your hook underneath the two loops on the top, highlighted in the photo below in red. But for this simple modification, you’ll yarn over and insert your hook into the loop DIRECTLY BELOW the top loop, as highlighted in green. This special loop only shows up on the back side of your HDC stitches, so we’ll be turning our work as we go. Here’s another view of that special loop, from the side. So to get started, you’ll want to create a row of regular HDC. For this tutorial, let’s say 20. You can do this by chaining 21, HDC in 2nd Ch from hook, and HDC across. OR, you can use the Chainless Foundation technique! Once you have your first row, Ch 1 (doesn’t count as HDC) and turn your work. You should be able to see those special loops now. Yarn over, and insert your hook under that first special loop. Complete your typical HDC stitch: Pull your yarn through, yarn over, and pull through all 3 loops on the hook. Done! Continue down the row until you’ve completed 20. You aren’t going to see that ribbing yet, unless you turn the work over and take a peek. The row you are working on creates the ribbing on the opposite side. Do a few rows and you’ll see a beautiful pattern emerge! I love this stitch,the pattern I had just called it a ‘rib stitch’. I used it for the cuffs and waistbands of sweaters I crocheted for my kids. Right now I’m using it as the main stitch with a super chunky yarn to make a jacket for my toddler grandson. I also knit,and this stitch is a must if you want a knitted look for crocheted items,without the extra work. I just tried this stitch because I think it is so beautiful. It doesn’t lay flat like yours shows. Am I doing something wrong???? Hmm… maybe a larger hook for the yarn you are using? every other rib row isnt,t crisp on one side what am I doing wrong? I’m not sure what you mean by “crisp”. I’m stuck with a project based on this beautifull stitch, i’m really frustrated, i need your help!! 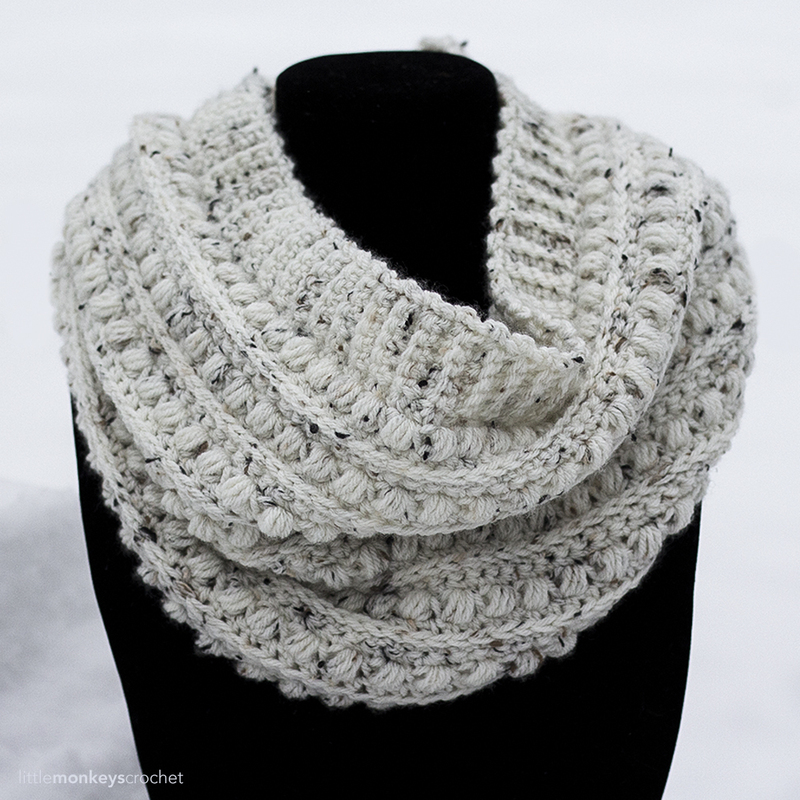 I’d like to crochet RibHDC in the round, to make a cowl and I just can’t figure out how i can make it seamlessly. When finishing each round, i join (in your first picture’s highlighted red loops) and turn in order to achieve the rib. Is this my mistake for leaving such an obvious joining line in my cowl? Is crocheting in the round without joining a solution or it’s gonna leave a spiral print? Thank you very much! I ll give it one more try without joining (spiral) or crocheting Ribdc instead…let’s see! I’ve been looking for some inspiration for my niece’s Christmas cowl-done!!!!! Thank you for sharing your knowledge and adorable patterns with us! I find fpdc and bpdc a little bulky too. I’m definately going to try this. This is so pretty! I’d love to use this stitch for a baby afghan. What # would you recommend I chain to get this started? I’m really awful at figuring that out, so any help you can give would be much appreciated! For reference, I’d like to start out with a chain around 100 or so. Not much bigger than that though. BUT BETTER YET!….learn how to do the foundation hdc for 1st row. It’s awesome! No counting chains OVER & OVER…plus they’re always too tight & pull in the work on 1st row, which is ugly. Foundation row crochet is great! It’s softer…not tight & drawn in as with chaining, and you stop when you reach the width you want & 1st row is DONE, WITHOUT CHAINING! Watch the video “The Crochet Geek” has on you tube. [Do search on youtube “Crochet Geek Foundation hdc” She goes in slow motion too for part of the video to really help you see the techniques. This is great advice! The first row always pulls in! I’m a crocheter of 42 years’ experience, yet I keep finding new things about crochet all the time. I never thought to go into that particular loop and create such a lovely pattern! Thank you for this post/Pin, because I was just about to rip an in-progress small blanket apart from frustration with the extremely slow “bobble” stitch. I think I’ll just continue on with this rib stitch, and wing it from there 🙂 ! Very pretty! I first heard it called Camel crochet years ago – crocheting under the horizontal bar. Thanks for the tutorial. I look forward to using the stitch. Brilliant. Just brilliant. The fact that you took time to post excellent photos, with color highlighting for the important parts, is extremely impressive. You really helped me out by providing this tutorial. Thanks! Great looking st ptn. It doesn’t look like the photo of the headband though. The ribbing on the headband looks much closer together. Is that due to the ribbing puckering more after more rows? The headband looks like it was done with ribSC, with the rows “appearing” to be closer together. Can’t wait to try this! Thanks for the “freebie” and the technique. I had seen that technique done in the horizontal bar “behind” the st, but doing it on the front side is “much” easier to see! Your sons are adorable! I have 2 awesome “grandsons” about the size of your boys! (Only with darker brown hair). . . AND a new (2 mo old) grand baby GIRL! So exciting! Thank you for all the lovely patterns! I just discovered your page, happy, happy!! Is this another name for the front post double crochet stick? this looks great. I have to find a way to print it off though. Can you print off the instructions you want to keep. I don’t… but wouldn’t those third loops be visible to you regardless? Love your tutorial!! Very easy to understand!!! Thank you!! I just tried it out and it was so simple to do. I have been looking for this! Of course, I am wanting it for ribbing for the bottom of tiny little baby hats so it won’t work for that in the round. I may play around with making my baby hats in the round and then crochet out a single crochet chain of about 5-7 chains and making a sort of cuff all the way around. This probably does not make sense but I am thankful to have this stitch to play around with! I found working a tight chain 2 at the beginning of reach row works better for me. I do NOT work in the chain 2. This keeps the first stitch the same height and I don’t miss the first stich of the previous row. Plus on my swatch I was working a loose chain 1 turn so i could work the first RHD and I have these loops. Other then my modification for me, you’re instructions are great. Very clear and I could do this stitch. Thank you for sharing. I’m wanting to crochet the rustic slouch hat and I’m looking at the pattern and it does not say how many CH stitches to start The hat can you please help me. Hi — when I look at the pattern I see a CH21 (chain 21). Hope that helps! Also, fantastic patterns on this site! I do love the rustic hat and scarf. This stitch really makes it! Hello I am stuck on the row where it say work in 3 loop. I am not sure what to do . Hi Elizabeth, what pattern are you working on? This is the tutorial where I explained what to do with those instructions. 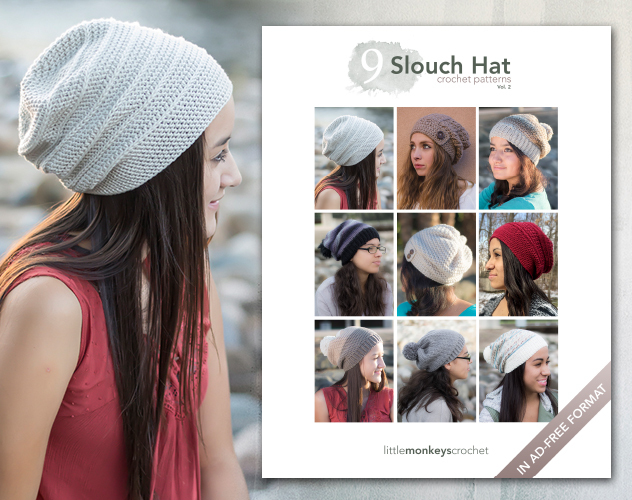 I’m also working on a tutorial (slouchy hat) and it refers to this tutorial as 3rd loop. I’m assuming it’s the same thing so I’ll just give it a go! Love this pattern, but when finished it was huge! Any idea where I went wrong? Had the right size yarn/hook and worked pretty tight. I might just try to reduce my # of rows/stitches. Thanks so much for the new stitch tutorial! It was very easy and different, and your instructions were impeccable! Thank you, Rebecca! This stitch is just what I was looking for to make a hooded vest with a zipper and patch pockets. I’m using 2 colors of Caron Simply Soft yarn with a G hook to get a striped look, the long way. 2 rows of each color alternating…..it’s really showing off the ribbed look! I’ll send you a picture when it’s done. Your instructions are fantastic! Thanks for the very easy and clear instructions. I want to make this pattern but not on something continuous, but as soon as I turn the work, Im stuck- because the patter changes. Please help!! I’m not sure I understand your question because this tutorial is for a turned work, not a continuous one. But just to clarify, when you’re turning, the 3rd loop is on the inside and if you are working in a continuous spiral, you’ll have to reach over the stitch to the outside to get to the 3rd loop. I have been crocheting for the past 45 years with a decade in between without anything productive. I just learnt something beautiful with your RibHDC. Thank you so much. I am going to try your April Crisp cowl. Once again thank you. How many skeins were required to make both pieces? You commented on a tutorial, is there a particular pattern you are wondering about? 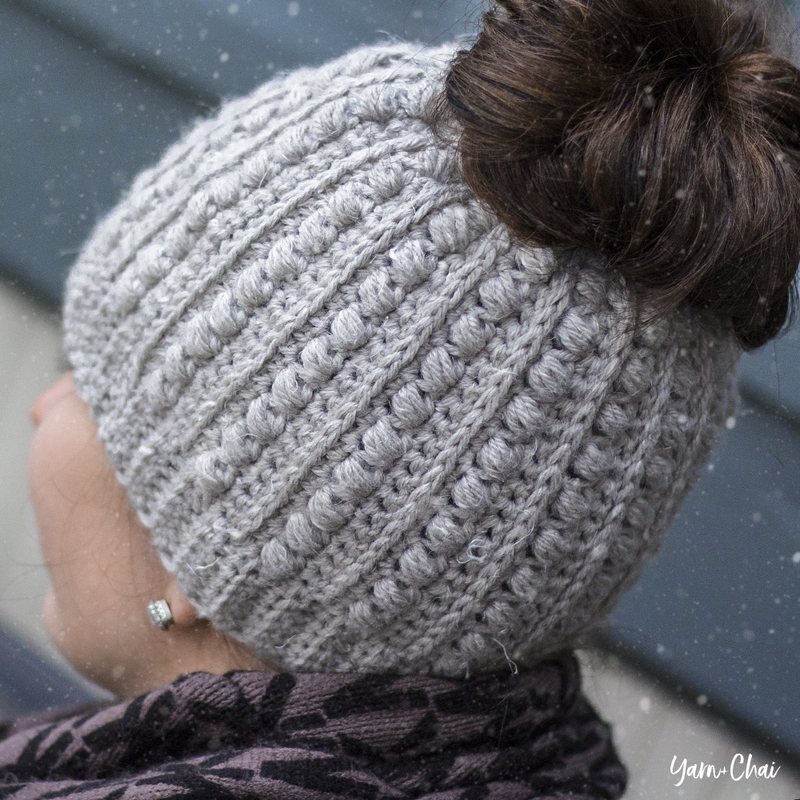 Yes, the Rustic Slouchy Hat tutorial. I want to see the tutorial for the Rustic Slouchy Hat and I go to tutorials but there is no where to open it, help. I really love this stitch and glad u used different color in ur tutorial. Makes pattern easier. Thank u!!!! Hola podrás poner video para tejer la gorra, gracias. She’s asking if you can post videos on how to crochet beanies. I have been grabbing this stitch for some time now. I do it to either create the look of surface slip stitches on the right side of my fabric, or to set up loops to work in for surface crochet on my project when working rows with the right side of my work facing me. I’ve learned that it’s called the “bar”. And, when working it for the reasons I’ve mentioned, it sits behind and below the normal working stitches. I call it the “back bar” of the Stitch. It pushes the normally worked top stitches forward and to the surface of your work. It’s not as easily accessed as your way of doing it. I feel like I’m standing on my head while peering over the top to see behind my work in an awkward attempt to locate then work in the bar. I love how you’re doing this! working in the bar with it facing front is so much easier! Plus, you are creating these surface chains on the front AND back of the fabric! Brilliant! 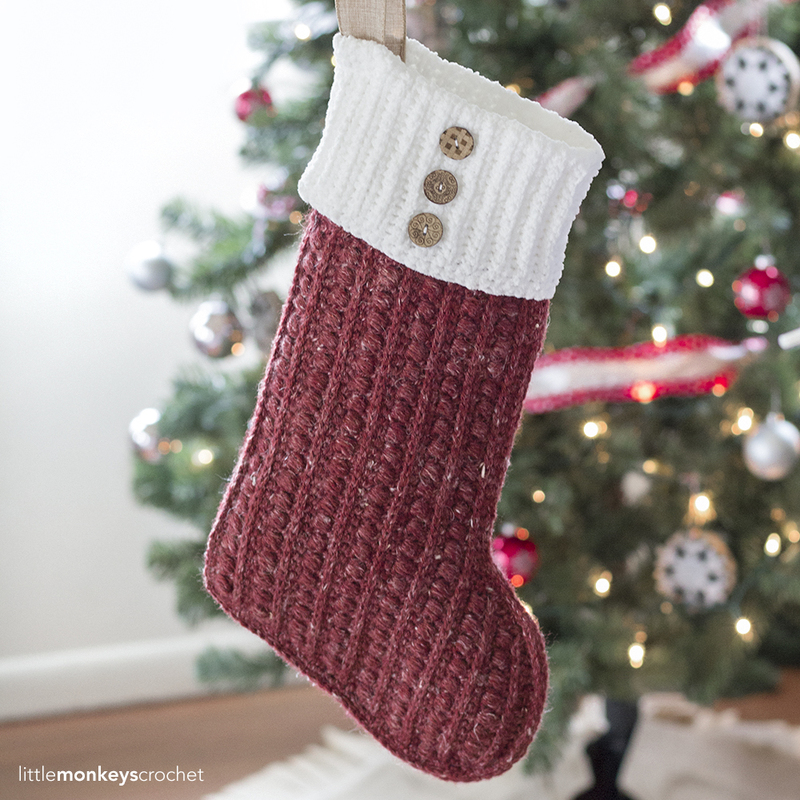 I get so many great ideas from all you crocheting /bloggers/ designers. The scarf looks really gorgeous! and I totally appreciate the free pattern but I’m a little confused when it comes to the ribbing..I’m not asking you a specific question so don’t worry I’m just making a statement. The part that I’m confused on is- I see no ribbing affect, I just see the top of the loop that the half double crochet makes. So the long line of stitches you see in the scarf that are up and predominant and obviously different from the rest are made from HDC. Does anybody else see it that way too? Wow, thankyou. A beautiful and useful stitch and so easy! Hi ! I would like to make a crib size baby blanket with this pattern, not sure what your 20 count means, is that the width of your project? How many should I chain to start for 36 inch, and do you know how many skeins of yarn an size of hook I will need?? Thank you for your help! I’m a beginner !!!! I love the look of this stitch and was wondering if the ribs could be done in a contrasting colour and if sp, when would I change colors? Thank you in advance for your help. Im not sure what to do on the “last stitch” of the row aka the chain. There is no loop to put it in. It looks like if i chain,turn and continue with the next row it will jut out like a skipped end stitch. The chain is only considered a stitch if the pattern says so. I very rarely write my patterns that way, but if you have one that says it is, you would just put your stitch wherever you would normally put it for stitching into a chain. Please I am a visual learner I love this pattern but I must have it visual. Thank you darling. This is a tutorial, not an actual pattern. There is no video tutorial for this tutorial at this time. So this pattern for a scarf is hdc, hdcfl, hdc, hdcfl… and end with a hdc? First, I love, love this pattern and so appreciate that it is free! I have 42 of the 64 rows done. These rows are not as wide as the first part at the beginning. I have 26 stitches in each row. Will that widen as I put the sc all around? Should I start over? Thanks for your help! I’m not sure what pattern you are doing, as this is just a stitch tutorial. 🙂 But whatever you’re working on, if your stitch counts are correct, it sounds like a tension issue and if you’re starting with Foundation stitches you might want to use a smaller hook for that row. I’m using this beautifu stitch to border around a baby blanket. Could use please explain how I would do the corners?? I’m using this beautiful stitch to border around a baby blanket. Could use please explain how I would do the corners?? I am using this beautiful stitch as a border around a baby blanket. Could you please explain how I would do the corner?? I just finished using this stitch to make a cute hat for a snowman amigurumi. I joined and turned and it left a seam, but I always have a seam from the join anyway so that’s no problem. I love it! The first 3 pics were difficult for me to understand. I had given up until I read another article, I wouldn’t have understood. I advise you describe these “special loops”.